Goodreads: When everyone thinks you’re dead, how do you start your life over again? Ope’s Opinion: This book was given to me, from my daughter Kristin of Kritters Ramblings. She loved this book so I went into with a very positive expectation. I think she liked it more then I did, but I did enjoy this read. If you have read my other posts, you know, I am slow to get into a book. This one was no exception. I enjoyed it from the beginning, but didn’t really get into it until part of the way through it. Don’t get me wrong it was good – it just takes me a while to feel involved. I can’t imagine coming back to a life that isn’t there anymore. Where do you begin to pick things up? How often do you think – if only I could start over? – Read this book and you may rethink that thought! Rating: 4 – I like the book so much I know several friends to share it with. 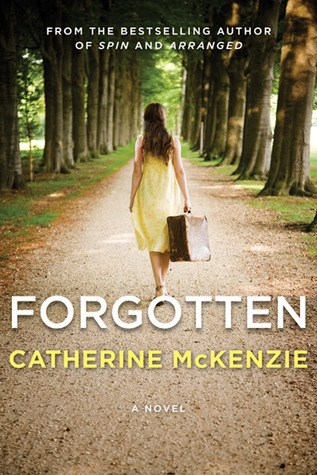 This entry was posted in Book Opinion and tagged Catherine McKenzie, Forgotten, Women's Fiction by opesopinions. Bookmark the permalink.